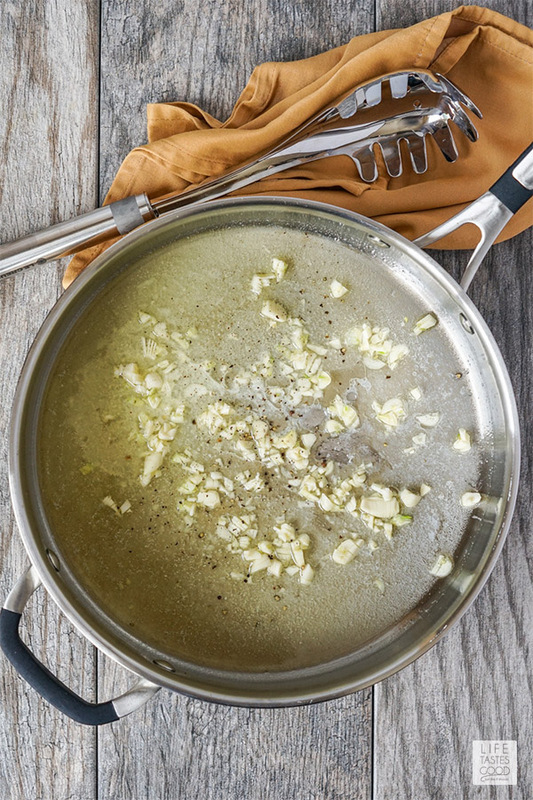 This Garlic Butter Sauce is a dream for garlic lovers with EIGHT cloves of minced garlic. Don’t love garlic as much as I do? Play around with the amount to fit your palate. I'm a HUGE fan of garlic & always recommend using fresh garlic in sauces whenever you can. It's pretty typical of me to add at least 1 tablespoon of fresh garlic to sauces like I do in my easy slow cooker Red Sauce recipe. Making a sauce for pasta doesn’t get much easier than this! With only two basic ingredients, the Garlic Butter Sauce comes together in less than 15 minutes including the time to cook the pasta! Add the pasta and cook, stirring often, until al dente, just tender. Reserve 1/4 cup of the pasta water. Drain the rest and set aside. While the pasta is cooking, place a large pan over medium heat. Add the butter and melt. Once the butter is melted, add the garlic cloves and cook just until fragrant, about 30 seconds to one minute. Do not brown. Remove from heat and season with salt and pepper. Toss the garlic butter sauce with the al dente pasta and 1/4 cup reserved pasta water. Top with Parmesan, parsley, and additional salt and pepper if desired. Serve immediately. WHAT TYPE OF PASTA PAIRS WITH GARLIC BUTTER SAUCE? I paired the garlic butter sauce with one of my favorite pasta shapes, Bucatini. 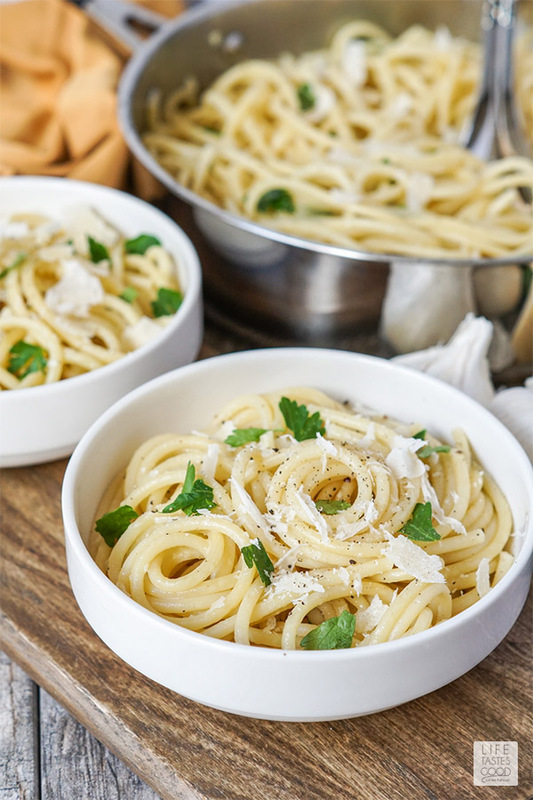 Becoming more and more available in larger supermarkets, Bucatini is a tubed pasta similar in shape to spaghetti, but it has a hole running through the center that is perfect for soaking up the garlic butter sauce. You can of course also use spaghetti, penne, rotini, or a personal favorite. DO I HAVE TO SALT THE PASTA WATER? YES! It's that simple. Always salt the pasta water with kosher salt. WHY? Because as pasta cooks it absorbs the water, right? By cooking pasta in salted water you are infusing the pasta with seasoning to enhance the flavor of the pasta. Salting the pasta water adds another layer of flavor to your dish, so always salt the pasta water. WHY RESERVE PASTA WATER AFTER COOKING PASTA? The addition of pasta water helps to thicken the garlic butter sauce while keeping it smooth and creamy. The starch in the pasta water will also give the garlic butter sauce a deeper, richer flavor. I use unsalted butter in cooking and baking almost exclusively mainly because it allows me to control the amount of salt I add to the food. Different butters have different salt levels, so by using unsalted butter it gives me the control over how much salt is added to my dish. By seasoning the food and tasting as I go, I can add just the right amount of salt for our tastes. Secondly, salt is a preservative, so salted butter has a longer shelf life than unsalted butter. In my mind, unsalted butter is fresher than salted butter. 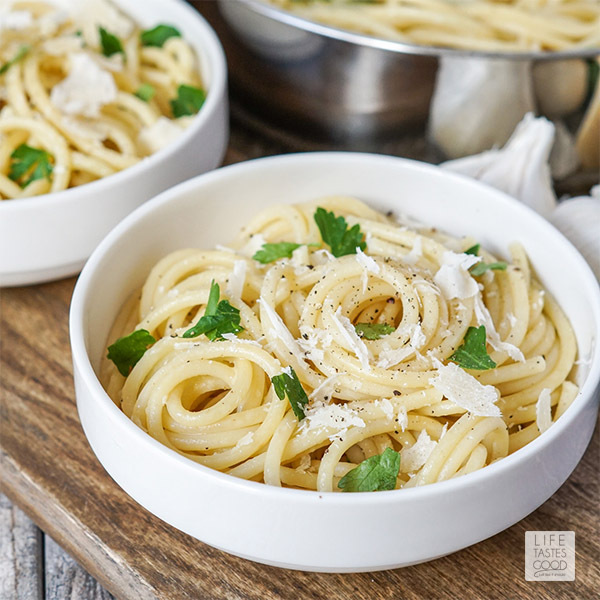 I often have a bowl of just this garlic butter sauce with pasta. It is quite good on its own, but also pairs well with grilled chicken and seafood. Mushrooms, asparagus, spinach, other greens like basil or arugula, and caramelized onions would be wonderful additions to incorporate some vegetables. You can also brown the butter a little before adding the garlic. As the butter darkens, it takes on a nutty quality to give this dish an extra boost of flavor. Definitely keep an eye on it though, because butter can quickly go from browned to burnt. LOOKING FOR MORE PASTA SAUCE RECIPES? 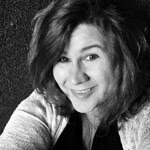 What kitchen tools do I need to make Garlic Butter Sauce? 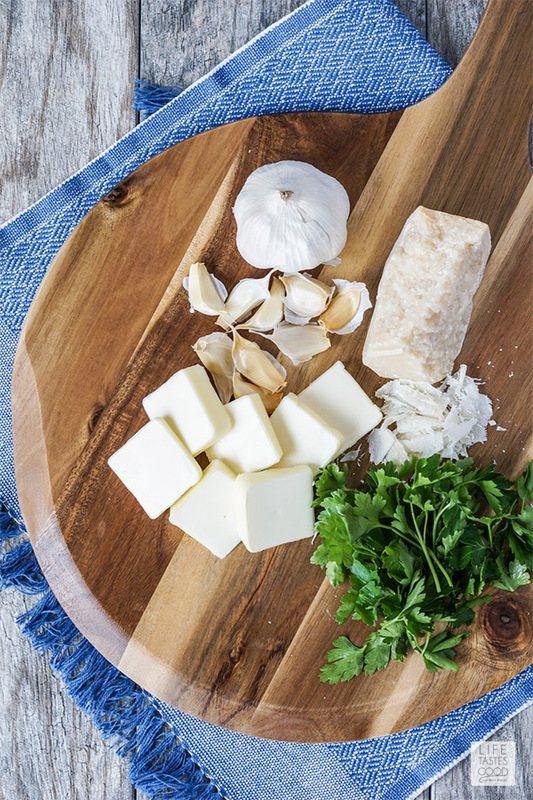 You may already have many of the tools needed to make this recipe, but for your convenience I've listed the tools I use when making this Garlic Butter Sauce recipe. Just click on the item name and find the product I use on Amazon. 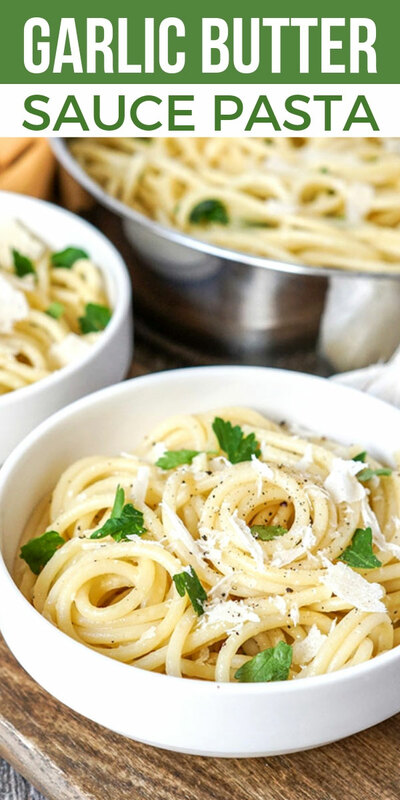 GARLIC BUTTER SAUCE FOR PASTA makes a QUICK & EASY dinner recipe the whole family will love. Garlic butter sauce is also perfect for VEGETABLES and DIPPING too!